Mark Grey has an Exhibition here. My photographic style: Cheeky and provocative. I work with subjects to capture the edge of their character: the element that makes them unique, intriguing and lovable. My greatest strengths: Interaction with people. I've mastered the technique and craft of photography so I can concentrate on what is important: YOU! How I got started in photography: University then Armed Forces. My photographic skills: Portraiture, lighting and creative direction. Relaxing subjects enabling their true character to flow out from the image. My personality: Outgoing, creative and passionate. Friendly and talkative. Inquisitive and experimental. And a little bit weird. Geographic areas I cover: London & Southern Counties. Venues I frequently attend: My studio, London's South Bank, Theatreland. Success in photography: 2 time winner of president's cup. Photographic training: LRPS, Army School of Photography. Major events: Marriage. Children. University. Army. Testimonials: Lucy Hemming: I would highly recommend Mark, he immediately put me at ease during our shoot. Before picking up his camera Mark was keen to know about our business and what I wanted to project through the photos. 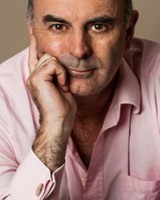 He's provided some great corporate photos which still reflect my personality! Mike Berry: Mark is a great photographer and totally professional. I wholeheartedly recommend him for all corporate/ portrait work. Sean Walker: Mark put me at ease from the moment I walked in to have my photos taken. He took time to know more about me, what I wanted the photos to be about and to find things we had in common in work and general life experiences. After the shoot he gave me great feed back on what photos to use and any enhancements that needed to be done. I will use him whenever I need this type service. Matt Oxley: We commissioned Mark to take our team headshots and were delighted with the work. He took time to understand our company and culture. We didn't just get a set of great portraits: we got marketing tools. Mark is not only a talented photographer, he is extremely accommodating and a great personality. Mark will make you feel at ease during what can be a stressful experience. I highly recommend Grey Corporate- you'll be more than happy with the results. Excellent service!! Highly recommended! Takes the time to understand your photo objectives and delivers on time with excellent quality. Why I like the SWPP: Great training and resources. Wonderful Conference each year at a Central London Location. Future plans: Currently working on two self commissioned projects: Buskers and Camera Unfriendly. Will also be developing Actor Headshot practice.